A product is said to be of desired quality when it complies with the specification as well as customer’s requirements and expectations and when it displays basic, performance and excitement functionalities. Products are produced by manufacturing processes. Also, quality cannot be tested into the product. It is to be built in the product by the manufacturing process during its manufacturing. One of the main factors which affect the quality of the product is the quality of the manufacturing process which produces the product. Sound and reliable processes produce quality products. Hence improving the quality of the manufacturing processes is a precondition for better product quality at an acceptable cost. Process as used in the terms process control and process industry, refers to the methods of changing or refining raw materials to create end products. Process control refers to the methods that are used to control process variables when manufacturing a product. Organization controls the production process for three reasons namely (i) reduce variability, (ii) increase efficiency, and (iii) ensure safety. Process control can reduce variability in the end product, which ensures a consistently high-quality product. Procedures – These are a series of steps followed in a regular, definite order. Methods – These are an orderly arrangement of a series of tasks, activities, or procedures. Materials – These are tangible elements, data, facts, figures, or information needed which along with equipment and supplies make up inputs required. People – They are numbers of individuals, skills they require, goals, and tasks they perform. Training – It is needed so that the people acquire skills and knowledge required to complete the process. Other resources – These are additional resources which are needed for processes to be efficient. Support processes – These include those processes which are necessary for the main processes and include such processes as power generation and distribution, generation of utilities and distribution, testing laboratories etc. Attaining of the defined and consistent levels of the product quality levels is achieved by ensuring that the manufacturing processes remain stable and robust while operating them. Process control and understanding is an important feature for a knowledge based manufacturing process. The on-line process control has been well known for around the last 3 decades. However, quality has different meanings to different organizations. For instance, for a large organization which produces a standardized product, the major target associated with quality is ensuring close adherence to the defined product specification. In contrast, for a smaller organization, quality means, in many cases, guaranteeing the flexibility to fit the end-product requirements in relation to rapidly changing market needs. Moreover, nowadays the concept of quality often goes far beyond a specific product but embraces the concepts of plant quality and total quality management (TQM). However, what all views of quality have in common is their dependence on the manufacturing process for achieving the intrinsic properties of the product and knowledge of the relationship between process parameters and product functionalities. On-line and inline quality control and process optimization are only successful when based on appropriate process analysis and process understanding. During the product manufacturing process, there are several quantitative process variables which need to be measured, captured, and controlled in order to obtain a product of the desired quality. Process control consists of controlling the key process variables during the manufacturing process of the product. Key process variables are those factors which can vary during the production process and have large effect on critical product characteristics, i.e. those characteristics which best indicate the quality of the product besides having effects on productivity, efficiency and safety of men and equipment etc. There are six process components which affect the quality of the products. These variables are (i) raw materials, (ii) facilities and equipment, (iii) production process, (iv) packaging and labeling, (v) testing laboratories, and (vi) control procedures. Process control is a concept which propagates that the quality of the products can be controlled at the targeted value, if these six process components are monitored, regulated and controlled at the desired parameters at different stages during the manufacturing of the products. When the final products are produced through a set of several processes mostly operating in series then monitoring and control of quality of intermediate products assumes importance for the control of the quality of the finished product. In such case it becomes seventh key process component. Measuring and monitoring the process control variables allows the operating personnel to estimate the product quality and take appropriate action down the line. By taking an approach for the product quality which is oriented towards process control the early identification of the quality related problems becomes possible. This enables the operating personnel to take measures to counter these problems and produce quality product. Process control helps the operating personnel to experience the problems early and allows them to take action at appropriate time during production for isolating the problems. A quality control approach ensures more effective feedbacks and also helps the deployment of resources effectively in those areas where they are needed most. The approach during the process control consists of identifying, measuring and analyzing key variables of the processes. Also, the process quality, product quality and user needs are linked. Hence, the identification and measurement of key process variables are important elements in the control of the product quality. The user needs related to the product quality and its link to process control is as below. 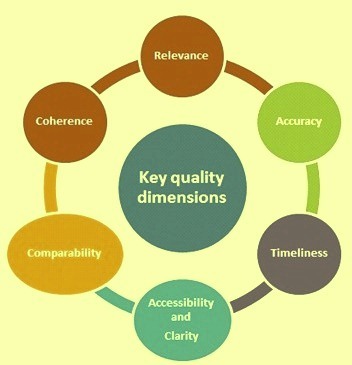 The point of departure of the product quality from the quality indicators is the ‘user needs’. The users demand product quality which encompasses desired attributes of physical, chemical and metallurgical properties. Cost is required to be taken into account for efficiency of the processes. Output quality is to be balanced against costs. Study of processes is a precondition for obtaining the desired product quality. This includes the identification and measurements of key process variables affecting quality and costs. The process control has the following steps which need to be followed. Identification of the critical product characteristics. Develop a process flow chart. Determination of key process variables. Evaluation of the measurement capabilities. Determination of the stability of the critical process parameters. Determination of the capability of the processes for the achievement of the product quality. Establishment of a system consisting of procedures and recording of data for continuous monitoring of the processes. Though it is difficult to measure most of the output quality dimensions, but it is possible to relate some process variables to the quality dimensions. Further the complete understanding of the full process is essential for identifying the sources of variation in the process. At this stage both the quality control personnel and the operational personnel are to work as a team. Here there is a necessity to understand the importance of describing and understanding the process, and of distinguishing between – and identifying those responsible for – actions and decisions. These are listed below. The sequence of processes is delineated, indicating decision points, the flow of the process for each step. The owners of each process are identified. The key process variables, decisions, or actions that can be taken by those involved in the process are listed. However the process variables are in general different from the quality indicators, which are more closely related to product quality. It is important to identify those critical process variables which have very high influence on the critical product characteristics. A process variable can be a thing which can change with time when the process is being operated. All the processes have numerous variables, and so it is important to identify the most useful (or ‘key’) variables. The factors which differentiate a key process variable from any other process variable those judged to have the largest effect on pre-defined critical product characteristics. This judgment of which variables are ‘key’ variables may be based on evidence, or else may be purely subjective. Different people may have different opinions on the importance of variables. Hence it is important to measure and analyze several variables before deciding on which are key variables. After identifying the key process variables, it is necessary to know how accurately these variables can be measured. If there are significant errors in the system used to measure the process variables, the measurements are unreliable and can invalidate any analysis of the process stability and capability. Therefore evaluating measurement capability is essential to ensure a good basis for process control for the production of a quality product. The measurement process used is to be capable of having the mean squared error to be small relative to the overall error requirements. An effective and efficient process control system is accomplished by using on-line and in-line sensors and ensures full control on the quality of the products. Besides the organization by an integrative and system-oriented approach based on process analysis and process control, experiences significant competitive advantages in the manufacturing of high-quality, customized products. Explicitly, the following goals are achieved with the deployment of process analysis and process control tools. Increase in productivity and product yield. Minimization of energy and resources consumption. Minimization of expenses for safety issues in the production facility. Decreased number of customer complaints. Anticipating maintenance and process-integrated self-diagnosis. Assured constant and certified product quality. Process control increases the production efficiency due to the following. Deep understanding of the production process. Integration of quality into process steps. Reduction of quality overhead costs. Higher production quality resulting into consistent product quality. Process control approach for building quality into product is a feed forward control approach which is knowledge based and where the product quality is achieved by focusing on stability and robustness of the process which has to be fully optimized. This stability of the process is achieved by a close control of the critical parameters of the process. In-process controls are checks which are carried out before the manufacturing process is completed. The function of in-process controls is monitoring and, if necessary, adaptation of the manufacturing process in order to comply with the specifications. This may include control of equipment and environment, too. In-process materials are to be tested for identity, strength, quality and purity as appropriate and approved or rejected by the ‘quality control personnel’ during the production process. Rejected in-process materials are required to be identified and controlled under a system designed to prevent their use in manufacturing. Written procedures need to be established and followed which describe the In-process controls and tests as specified. In-process controls may be performed in regular intervals during a process step or at the end of a process step. The objectives of in-process control are both quality control and process control. The function is of process control is performed by documenting production parameters. In a broader sense, this includes the following in-process controls. Measured values obtained from process equipment, e.g. temperatures, pressure, speed etc. Measured values obtained by operating personnel e.g. product dimensions etc. Product attributes, e.g. weight, hardness, appearance etc. Measured values obtained from the room environment, e.g. particle counts etc. Tests conducted on the input materials. Test conducted following completion of intermediate products. The classic interpretation of the term in-process control includes the recording of measured values by the operating personnel. Effective process control ensures safe, efficacious, and defect-free high quality product which in turn aids in customer satisfaction. It helps in reliable, risk mitigated, reliable, and efficient manufacturing operations. Process control consists of three basic activities namely (i) evaluation of the actual performance of the process, (ii) comparison of the actual performance with the desired performance, and (iii) taking of action on the difference between actual performance and desired performance. Control begins to satisfy the product quality requirements. Each requirement of the product quality is the target at which the process operating personnel directs its efforts. All controls are centered on specific things to be controlled. Each control is the focal point of a feedback loop. Controls are a mixture of the following. Product features – Some controls are carried out by evaluating features of the product itself. Product controls are associated with the decision so as to ensure that the product conforms to specifications. Inspection is the major activity which is usually performed at points where the inspection results make it possible to determine where breakdowns may have occurred in the production process. Process features – These are main areas where most of the controls are directed and which most directly affect the product features. Some features need control so as to avoid or reduce failures. These control are typically are chosen from previously identified critical factors. Process controls are associated with the decision such as the process is to run or stop. Side effect features – These features do not affect the product, but they may create troublesome side effects, such as irritations to employees, unsafe working, threats to the environment etc. These three types of controls are found at several different stages of the process namely (i) setup / startup, (ii) during operations, including running control, (iii) product control, (iv) supporting operations control, and (v) facility and equipment control. Process control has many other beneficial effects for the organization. These include the following. Availability of the processes and their long term stability. User friendly equipment and devices. Unified process documents which are traceable. Safe working of the processes.